click the Calculate button below. For Fireplaces And Square/Rectangular Fire Pits. Having the correct amount of Fireglass glass will help make your fireplace design project successful. To aid in this we have provided a couple sketches to show you how to measure your fireplace or fire pit and a handy calculator to do the calculations for you. All need to do is follow the instructions below and you are on your way. 3 Inches of total fill is recommended. This can be accomplished with 3 inches of glass fill or 2 inches of glass fill along with 1 inch of lava fill (the cost savings method). 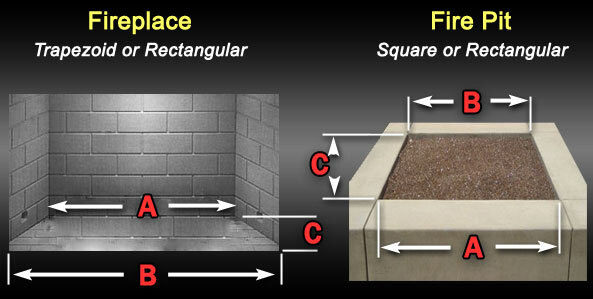 Use the image to learn where to measure inside your fireplace or fire pit. Then enter your measurements into the calculator and click the "Calculate" button to see how many pounds of glass and pea size lava rock you need. Use the Burner Size calulator to find the best fit.